It’s about more than just looking the part. Your fishing vest gives you access to numerous bait types with a varied number of pockets, maintains your body temperature on those cold mornings, and keeps everything within arm’s reach, so you never miss your opportunity when there’s a tug on the line. 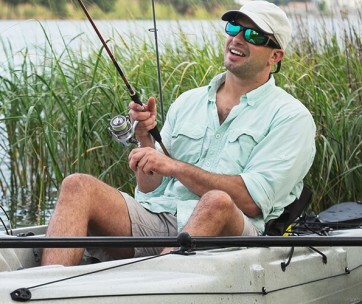 In short, the best fishing vests are your companion when you’re out on the boat or parked by the shore. We’ve not only taken a look at an excellent assortment of fishing vests, but we’ve tested them, and devised exactly what you need to be on the lookout for. It’s time to upgrade your fishing game, and it starts now. You mean you didn’t have an uncle Milty? Rothco took the most classic fishing vest design, and put their own twist on the aesthetics and function. With the Uncle Milty fishing vest, you’ll be able to dip into over a dozen different pockets, and stash your bait, extra hooks, and just about anything else you’ll need, including your smartphone. While the polyester material helps to keep you warm, it is very thinly crafted. Veteran fishers will have to be a bit careful not to tear it. The only other major downside is that it’s difficult to clean, primarily because of all the zippers and pockets. Stains are difficult to lift, but odors do wash out fairly easily. Rothco built this with an accurate sizing chart in mind, so what you select is what you get: nothing runs small or too big here. Last but not least, you get a little extra protection from the single fold-over button closure over your zipper, and three solid colors to choose from. This is a perfect gift for fishermen in your life. You’d be surprised at how quickly a dozen pockets get eaten up, so how about twenty-six? That’s how many pockets the Master Sportsman fishing vest comes with, which gives you an absolute ton of space for bait, extra hooks, and just about everything else you can imagine. Each pocket has a sturdy closure, most of them being zippers. You get a zipper closure on the vest as well, with an addition fold-over snap button to keep things nice and secure. We just wish that this vest was a bit longer. It rides up fairly high on your torso, even if you’re a slender guy. While the material feels great and remains breathable, the primary build is cotton, so stains and odors are far more likely to kick their feet up and stay a while, even after a long spin cycle. So long as you keep the usage lightweight, this inexpensive vest is an excellent way to conquer the water, and fill up your cooler before you head out. Everything is at your fingertips, including a loop to hold onto your rod while you’re sorting through your catches. Be sure to also check out our list of the best fishing nets for more great items like this. When was the last time you had a true fly fishing vest? M MaximumCatch is willing to bet that even if you could recall your old fly fishing vest, their model would beat it tenfold. We’re inclined to agree. You get a total of sixteen pockets, and a fully adjustable harness system that can loosen at the shoulders and waist. That helps it retain its breathable design, keeping you cool from dawn until dusk. The only major design flaw is that half of your pockets are located on the interior section of your fly fishing vest, making them partially inaccessible. You also get a removable foam pad that’s in a pocket in the vest. Trust us, you’ll know that it’s there. It’s fairly obvious and ironically uncomfortable, so we recommend removing it to regain mobility. Minor gripes aside, M MaximumCatch created this out of durable materials, making it simple to wash. Since the design is breathable, the entire vest is lightweight, keeping your mobility on-point throughout your fishing trip. Be sure to combine this with a cool fishing shirt from our list. If you’re sitting on a boat with your rod poking in the water, you might nod off a bit. We’ve all done it, but on rare occasions it could send you tumbling into the water. With an ONYX on your back, you’ll be right as rain. This doubles as a floatation device to keep safety as the top priority, and also includes breast pockets and loops to keep everything close at hand. The downside is, there aren’t very many pockets, so you have to plan your space usage wisely. Sizing is also a bit wild here. For us, and many gents who have tried out an ONYX vest, it’s oversized. Even if you follow the sizing information, it runs big. By far, our favorite feature had to be the drop-down tackle box tray, keeping everything accessible when you’re in the heat of the catch. ONYX created a great fishing vest here, with a sturdy front zipper and adjustable design, at half the price of many major brand vests. Our handy guide to the best fishing shoes features more great products like this. While fly fishing vests aren’t exactly the most attractive things you could wear, they need to be mobile. Anglatech crafted a lightweight vest with plenty of breathability, including a mesh backing that helps promote proper airflow, and keep sweating at bay. Nothing is worse than quite literally slipping out of a sweaty vest at the end of your trip. While it’s a great fit and completely adjustable, you won’t get to use all of your pockets if your want full range of motion: after about half capacity, you’ll feel weigh around your midsection and your elbows banging against the pockets. That doesn’t exactly feel good when you factor in the low quality in the zipper, the very component that’s keeping this vest slung over your shoulders. Don’t get us wrong, it’s a great vest, but better used for the minimalist fisher. That being said, there are two completely waterproof pockets to protect your valuables, such as a smartphone or a fishing watch that isn’t currently in use. You can slip into this vest knowing it’ll last for a decade or more with proper care, just don’t overfill it. Love this product? Check out our review of the best fishing backpacks for our top picks. 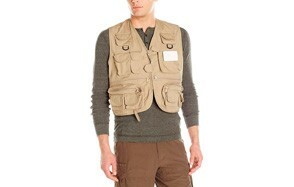 There’s nothing wrong with the traditional fly fishing vest look. 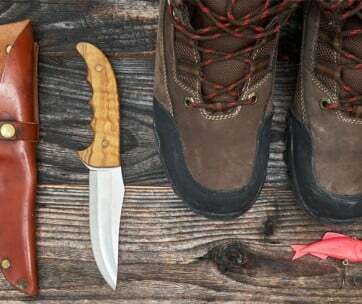 After all, it’s functional, and the perfect item for a minimalist fisherman who’s not looking to take the entire bait and tackle shop out on the boat with him. Allen Gallatin’s design keeps this totally breathable, but since it’s made of a durable nylon construction, the pockets aren’t very expandable. If you’re trying to stuff items in over capacity, you’re going to have one hell of a time zipping that pocket up. On the subject of zippers, you’ll notice rubber caps on each one. These are fairly poor quality and will wear out very soon. With those small grievances in tow, note that the vest is extremely comfortable to wear. Traditional fly fishing vests put a strain on your neck and muscles, but with a padded neck piece and adjustable shoulder straps, the last thing you’ll be worried about is comfort, or stiff shoulders after you slide out of your vest. Find more great products like this by checking out our guide to the best sunglasses for fishing. The one thing that we never really see fishermen talking about is the strain they’re putting on themselves. Kylebooker listened to this, and created a vest with a seriously comfortable pair of shoulder straps. This padding will not only leave you without tension on your shoulders, but it’s also completely adjustable to fit your size, no matter what. When it comes to fitting, it slips on like a glove, but it’s a different story when you fill the pockets to capacity. You’ll have an inhibited range of motion if you’re using the full storage capability of this vest. If you keep it about 75% full, you’ll be good to go. Apart from storage, the only other thing we would seriously change about this vest is removing those orange ties on all the zippers. They’re fairly poor quality and will tear and degrade in no time. Kylebooker still makes a fantastic vest with ample storage, equipped with durable zippers, and even includes a dual rod loop so you won’t be slugging your pole over your shoulder. If you need serious fishing equipment, make sure you check our guide to the best ice fishing shelters. M MaximumCatch has been putting out their famous Maxcatch lineup for years, and their standard fly fishing vest caught our attention. This vest comes with a premium design (without the premium price), but doesn’t hit every note the way we’d like. We’re big fans of the padded shoulder straps, but not exactly thrilled that when you pull on the adjustable straps, it tightens in the shoulders and leaves your lower section just sort of dangling there. If you’re using the pockets to store as much as possible, there’s another minor flaw. The center zipper closure can only handle so much stress. When the pockets are full and pulling in two different directions, the zipper starts to slide down on its own. If you aren’t bringing the entire tackle shop with you, then you should be good to go. You’ll be able to enjoy the Maxcatch’s eyelet line feed, and stave off sweat with the full mesh panel construction in the back. It’ll stay breathable and won’t eat a hole in your wallet, but it wouldn’t be our first pick for an all-day fishing affair. Don’t forget to also check our guide to the best fishing watches. Our last pick is another flotation device and fishing vest all in one. While that leads to there being way more padding than actual storage, it’s a toss-up if you want a versatile vest that can also be used during kayaking and white river rafting. The storage that you get won’t interfere with mobility, even if all the pockets are utilized to maximum capacity, for your knives, fishing bobbers, lures etc. Just note that those pockets are particularly hard to keep clean, as are the other components of this fishing vest. The star of the show is the eight-point harness system, designed to give you nothing but unparalleled comfort and a tight fit that you won’t find with any other vest. NRS went all-out to ensure mobility and a contoured fit, but didn’t forget the aspects that make this a great fishing vest. You have multiple D-rings all across the bottom half, two loops to stash your fishing rod in, and a mesh back panel to help keep you cool throughout the day. Be sure to combine this with a cool fishing hat from our list. Brand - There are some brands who have been in the business longer, and their adjustments over time show in their work. We avoided knock-off brands with shoddy manufacturing standards, and instead, focused on brands and companies that have been traditionally used by professional fishermen for decades. In this space, brand tells you a lot about what you can expect. Reviews - Dwelling on user reviews will always be a factor that goes into your purchase, no matter how hard you may try to look past them. You get firsthand experiences from users that have nothing to gain other than telling the truth. You can always pick out those few stragglers, but for the most part, user reviews help us determine our shortlist of products before we order them and head to testing. Design - Design and style are two different things entirely. You’re not looking to be suave or stylish here, you want function (and something that doesn’t look hideous at the same time). The design dictates function and mobility, which we’ve addressed with some bulkier fishing vests in the reviews above. Mesh - Mesh is usually used in the construction of back panels and other breathable sections of the vest. There’s nothing wrong with a mesh component, but the entire vest can’t be made out of mesh, otherwise your pockets would completely fail. 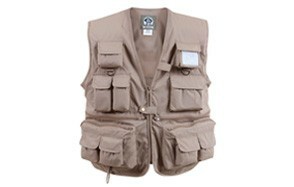 Fabric - Polyester, cotton and a few other choice materials are very common in fishing vest construction. Find a blend that has predominant polyester, as it has a great natural waterproof feature, and doesn’t stain or retain odors as easily as cotton. Q: What is a Fishing Vest? A: They’re that cliche item you always see fishermen in movies wearing. It’s not just a style, though: it’s all about function, and making the right move at the right time. When you feel a tug on that line, you need to jump to attention and bring your A-game. How can you expect to do that when you’re not prepared? Fishing vests help keep everything you could ever need right on-hand. That means linecutters, bait and tackle, additional hooks, just about anything you can think of that you might need in a pinch while you’re out on the boat or sitting by the shore. They also serve another function, which brings us into our next topic. Q: Can Fishing Vests be Used as Flotation Devices? A: Only if it’s clearly stated. You’ll find that most fishing vests are made of simple, thin materials that aren’t naturally buoyant. If a fishing vest also doubles as a floatation device, that will be a major selling point, and you’ll see it displayed clearly. 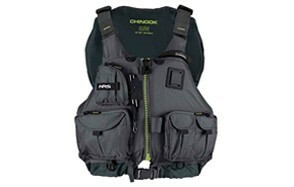 Flotation devices are usually foam padding that’s interwoven throughout various areas of the fishing vest. 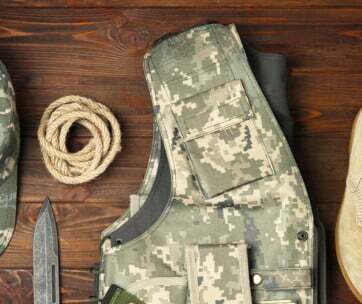 Keep in mind that these dual vests won’t have as much pocket storage, but will be suitable to use in other events, like kayaking or white water rafting. If you’re a bit of a daredevil when it comes to watersports, getting a hybrid vest will be your best bet.